Home/The Camping Life/Our Favourite Producers: Les Bruyères Carrées. 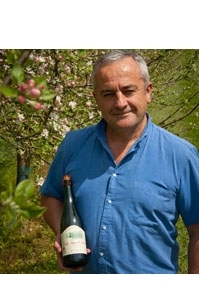 Today, let’s talk about our cider, calvados, poiré… producer, Benoît Charbonneau. A local mayor but also a producer of local products, Benoît, is a long term partner with whom the Campsite still works. In between the orchards and the animals you’ll find the cella, where everything goes on, after the harvest, of cround 10 different sorts of apple, onwards toward the cellar. Before the juice making, and the different drinks, apples are washed and sorted, it’s really meticulous work, after this they are put them in an inox press, this way of pressing apples, even though modern, garanties a high level hygiene. Then, all the different products take different paths in the production. Juices, ferment in the wood to become cider, and pommeau and calvados, they are then stocked in oak barrels. The mix between the old way of making it and the modern way makes the products taste excellent. But “Les Bruyères Carrées”’s Farm isn’t just a production farm but it’s also a place to visit, especially when the apple trees are in blossom, because the landscape is just magnificent, it is a place to see. You can find some of the products from”Les Bruyères carrées” in the shop, in the restaurant and in the bar on the campsite. Try the Poiré, if I like it you’ll love it!